It looks like I was a lot more industrious than actually occurred. Walmart (where I do 95% of my grocery shopping) sells a South West Chopped Salad kit that contains, obviously, pre-washed chopped salad but also a small bag of Dorito-like chips and a small bag of cheese as well as a pouch of Chipolte dressing. 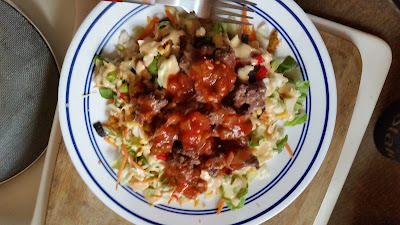 I brown some lean hamburger and put it on top of the Wally World salad and then dump on some Pace Picante (Hot) sauce. Takes about five minutes and tastes great! I eat them all the time and imagine it's one of the more healthy meals I eat. Give it a try!